Get your prestigious tickets to The Banqueting House - the stunning creation of celebrated architect Indigo Jones. Its unique appearance is considered to be the first example of Palladian design to appear on the streets of London. Built as an elaborate 17th century party venue Banqueting House's lavish decorations soon proved to be so popular that its owners were forced to stop hosting large events out of fear of damaging the fine works of art on show, many of which remain in place to this day. 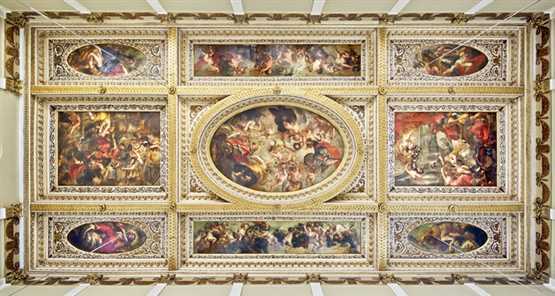 Ruben's canvases are among some of the most impressive masterpieces on offer spanning the entire ceiling of the famous banqueting hall. This painting would have been one of the last images seen by King Charles I before he was led outside to be executed in front of an angry revolutionary crowd. Discover the role Banqueting House played during the Civil War through a series of engaging exhibits and thoughtfully presented displays. Saving 15% on The Banqueting Tickets is easy, just make a booking online today! Please note: the last ticket is 45 minutes before closing time. With very few exceptions, the Banqueting House is guaranteed to open from 10:00 until 13:00 Monday to Sunday, but they often close at short notice for functions and events, so please check the times before your visit by calling +44 (0)203 166 6154/5. Closed Bank Holidays and 24 December – 1 January (inclusive). The Banqueting House is on the corner of Horse Guards Avenue and Whitehall – immediately opposite Horse Guards Parade. Westminster - turn right out of the station, first right into Whitehall and walk along until you come to the Banqueting House which is approximately half way up on the right hand side. Embankment - go out of the Embankment Entrance, turn right, cross Northumberland Avenue, turn right into Horse Guards Avenue, walk past the Ministry of Defence and the Banqueting House is approx 100 yards down on the corner of Horse Guards Avenue and Whitehall. Charing Cross - proceed as for the train (see below). Charing Cross - turn left out of the station's main entrance, towards Trafalgar Square. From there walk down Whitehall for about 5 minutes and the Banqueting House is on the left. Bus Routes – 3, 11, 12, 24, 53, 88 and 159.